Today, I’m honored to speak with retired astronaut Clayton Anderson about a pivotal childhood moment that inspired his life’s work, the challenges of being an astronaut, and his most vivid memories from space. What inspired you to make the journey to become an astronaut? It was Christmas Eve, 1968. I was nine years old when my parents put my brother and sister and me on the floor in front of a black-and-white TV around midnight. We sat on an old throw-rug gifted from our grandmother to watch humans circumvent the moon for the first time in human history. As I watched the control center team and listened to the flight director bark out commands, I was enthralled. “I need a Go/NoGo for the trans-lunar injection burn… FIDO? GO! Retro…? GO! Surgeon…? GO! GPO…? GO! The entire team was GO! The craft disappeared behind the moon, leaving me to enjoy the rapid-fire chatter no more. It was simple static on our TV… for about 15 minutes. Then, after a couple of non-answered calls from the Houston CAPCOM to the Apollo 8 crew, I heard the quindar tone (famous “space-beep” you hear on TV), and the first words from the Apollo 8 commander, Frank Borman: “Houston, Apollo 8. Please be informed there is a Santa Claus!” That’s all I needed. The bit was set in my mind that one day, I would become a United States Astronaut. How did your perspectives change while on the International Space Station? I am a man of faith. Seeing our earth from orbit did allow me to have the “orbital perspective” so many astronauts speak of. However, while I totally agree that this perspective changed my outlook and my willingness to do better with trying to protect and preserve our “spaceship earth,” it strengthened my faith in God much more. The earth and those of us privileged to be on it, is not random. There is a reason why Sir Isaac Newton discovered gravity and invented calculus. There is a reason why Albert Einstein was able to derive the Theory of Relativity. While I am unable to truly explain my rationale, I believe that there is a higher power. A power that created this universe and gave humans an adaptable brain. That incredible gift will continue to enable us to uncover the secrets of the universe, continuing to strengthen my faith. What was a big challenge you faced during your career? The dream of flying in space as an American astronaut was something I pursued for many years of my life. To have finally been selected and given that opportunity is incredible. Yet having the “best job in the universe” is not without difficulty. For me, it was family separation. I love my wife and kids more than anyone… on or off the planet. To have to be separated from them for months at a time was extremely difficult, especially given their ages (6 and 2) when I began my training. It got easier as they grew older, but it didn’t assuage my guilt very much. While I lived my dream, they sacrificed greatly, and I will spend the rest of my life trying to repay them. What is your best memory from being in space? Seeing my hometown from space…for the very first time, is a very, very close second. On that day, when I expected to excitedly capture photos of my Ashland, Nebraska, I had everything prepped and ready to go. Equipment was strategically placed around the U.S. Lab module’s earth-facing window, cameras were Velcroed securely to the wall, with timers set to remind me when to get into position. Finding my home on earth—without all the wonderfully placed lines, borders, squiggly river italics, and large stars designating capital cities—was tougher than I imagined. But when I finally found success, and saw Nebraska rolling into view by virtue of a big gray splotch known as Omaha (and a smaller gray splotch further southwest called Lincoln), the south bend of the Platte River was the last valid vision I had. When I saw my home, nestled there where the river bent, the place where I was raised and where many of my family and friends still reside, I took not a single photo. I simply broke down and cried. Overcome by the incredible emotions of floating weightlessly, as an American astronaut flying 225 miles above the exact spot where I was born and raised, having first dreamed of doing exactly that, was simply too much for me. So, I did what seemed to come to me naturally. I wept. Thank you so much for sharing your thoughts and memories of your incredible career. I wish you all the best with A is for Astronaut and all of your future endeavors as you inspire children and adults to always reach for the stars. Retired Astronaut Clayton Anderson spent 167 days in outer space, having lived and worked on the International Space Station (ISS) for 152 days and participated in nearly 40 hours of space walks. With a strong belief in perseverance and the importance of STEAM as part of every child’s education, Astronaut Anderson brings his “out of this world” insight to issues faced by children, parents, and educators. His website: astroclay.com | Facebook | Instagram | Twitter. For speaking events and appearances visit www.AstronautClayAnderson.com. Today’s holiday hopes to inspire people to slow down and enjoy life’s simple pleasures—like gazing up at the sky and really seeing the beauty that’s there. Throughout the day and night, the sky presents an ever-changing world of color and motion, depth and light. It’s a work of art like no other. Ever since the earliest times, people have been fascinated with the sky, directed by the stars, and questioning of what lies beyond. Today, we also celebrate those poets, mathematicians, scientists, and especially the astronauts who have explored the sky and brought all of its wonders a little closer. Sleeping Bear Press sent me a copy of A is for Astronaut to check out. All opinions are my own. I’m also thrilled to be partnering with Sleeping Bear Press in a giveaway of a signed copy of A is for Astronaut and a tote bag. View details below. There are some books that just make you say “Wow!” when you open the cover. A is for Astronaut is one of these. Leafing through the pages is like stepping out into a clear, starry night, visiting a space museum, and letting your own dreams soar all rolled into one. When you settle in to read, you discover that each letter of the alphabet introduces both poetry and facts to enthrall space lovers. Image copyright Scott Brundage, 2018, text copyright Clayton C. Anderson, 2018. Courtesy of Sleeping Bear Press. To get things started, “A is for Astronaut, / the bravest of souls. / They fly into space / and assume many roles. / They pilot, they spacewalk, / and they even cut hair. / But seeing Earth from our orbit— / that will cause them to stare!” A sidebar reveals more about astronauts—even astronaut nicknames! Both children and adults who have an affinity for space travel and all things related to astronomy will want to dip into A is for Astronaut again and again. With his wealth of knowledge and engaging voice, astronaut Clayton Anderson presents a book that will have readers starry-eyed and full of the kinds of facts and tidbits that answer questions and spur further discovery. 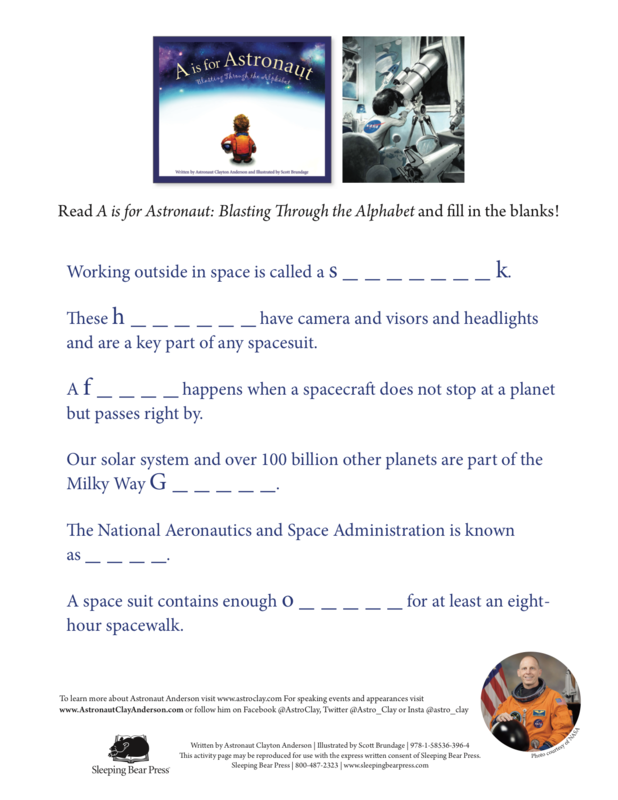 A is for Astronaut can be read through from A to Z for its vivid poetry or explored in small chunks to absorb the fascinating facts included with each letter—or both. Expertly written for kids of all ages, Anderson’s A is for Astronaut is a stellar achievement. Scott Brundage’s incredibly beautiful and detailed illustrations will thrill space buffs and serious scientists and engineers alike. Readers will love meeting astronauts tethered to their ship while working in space, experiencing the vibrant, mottled colors of a darkened sky or distant planet, and viewing the technological marvel that is the NASA control room. With the precision of a photograph and the illumination of true artistry, Brundage’s images put readers in the center of the action, where they can learn and understand more about this favorite science. A is for Astronaut is a must for classroom, school, and public libraries and would be a favorite on home bookshelves for children (and adults) who love space, technology, math, science, and learning about our universe. To learn more about Scott Brundage and view a portfolio of his publishing and editorial work, visit his website. 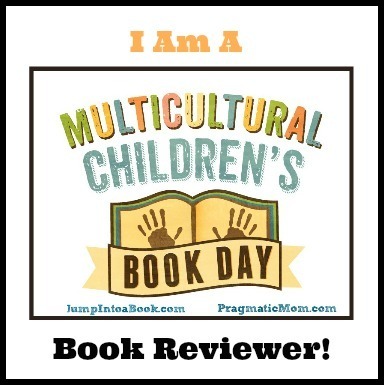 Visit Sleeping Bear Press to learn more about A is for Astronaut. 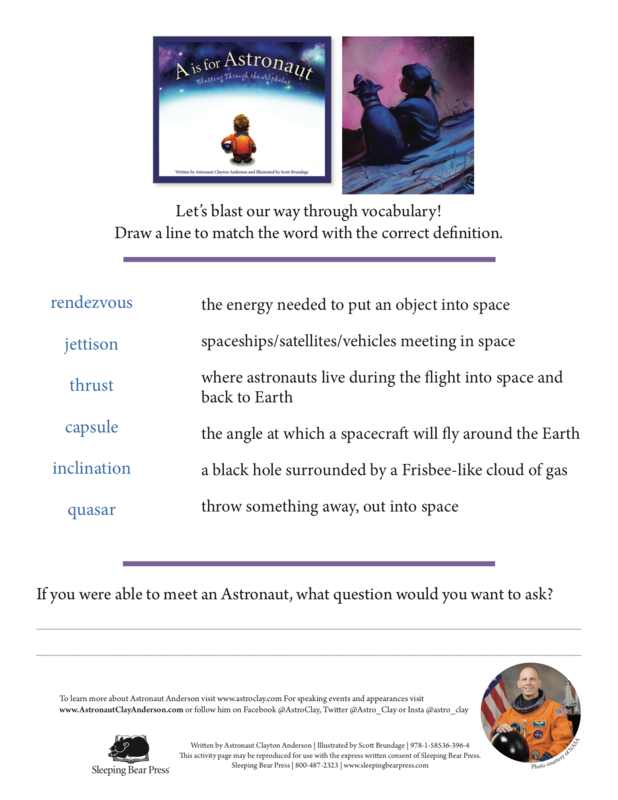 Show your excitement about all things space-related with these fun activity sheets from Astronaut Clayton C. Anderson and Sleeping Bear Press!